The day of set up started early Sunday morning for the match crew at the May classifier match. Many members spent a long day Saturday shooting in Ohio and got little sleep before arriving ready to put on an exceptional match. Unlike usual classifier match with six classifiers and two field courses, this year the match design team (Brian, Rob, Roy, Bill, and Bob) figured a way to squeeze in a third field course for a total of nine stages. A big thanks to everyone that assisted with set up and RO; especially the non-members who are not expected to assist. The lunchtime pizza from Little Caesars was a nice treat and got everyone in a good mood for a later than usual start. In total, we had 85 shooters participating. Production was the game of the day with 33 shooters followed by Limited (20), Single Stack (13), Open (10), Limited 10 (8), a lone brave revolver shooter (Dean D). 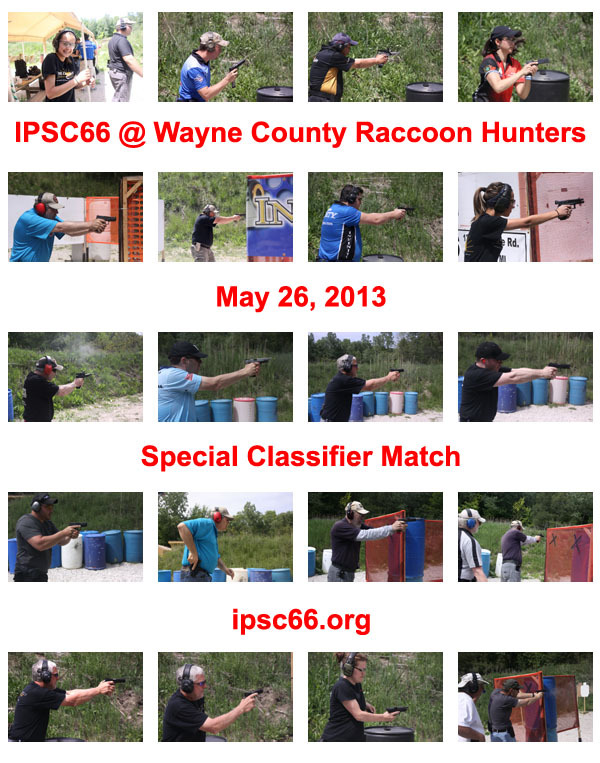 Many attendees used the classifier match to shoot in a division not normally shot or to get classified in a new division making the reloading single hand shooting action interesting on some stages. The clear winner of the day would have to be Russell M, the master class production shooter who won overall and had exceptional scores of 100% on two classifiers (CM09-11 and CM06-02). Chris B also scored a 100% on CM09-11 shooting his production pistol. Congratulations to all division winners: Russell M, Craig B, Geoffrey S, Mike L, Dean D, and Mike H.